Today ONLY - Golf Gadgets $65.99–$116.99. The Nexus Laser Rangefinder offer next level accuracy, feel, and performance. To play your best golf you need correct information. 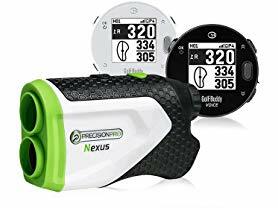 The Nexus Laser Rangefinder gives you exact distances to the flag making club selection simple and consistent. Our laser technology is accurate to 1 yard and shoots distances to the 1/10 of a yard. The Advanced Target Lock Function filters out background objects ensuring you shoot the flag, not what's behind the flag. Play better, practice better, and improve your accuracy with the Nexus Laser Rangefinder. Measures distances up to 400 yards away ensuring you'll never be out of range of your target. 1/10 Yard Measurements ensure you are getting an accurate distance measurement down to the 1/10 of a yard. The Advanced Target Lock Function filters out background objects ensuring you get the measurement to the flag and not what's behind the green. Dimensions: 1.8" x .5" x .5"